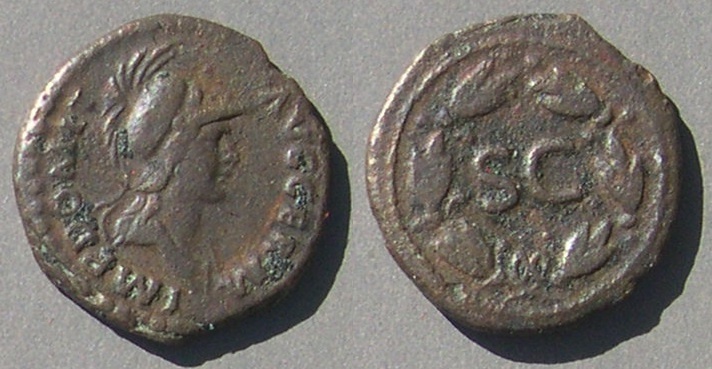 In the first and second centuries AD the quadrans was the smallest Roman coin denomination. It was not worth much then, it was not issued in large numbers, and it was not hoarded, so is not common now. The semis was worth two quadrantes (quadrans is singular, quadrantes is plural) and is even less common. Production of both stopped sometime in the middle of the second century, probably because inflation finally made them worth too little. To the right is an "anonymous" semis, 18 mm in diameter, with a bust of helmeted Mars right/cuirass with S C [RIC II page 218, 19]. It is "anonymous" because omits the name and portrait of the emperor. The anonymous types are attributed to the period from Domitian (81-96) through Antoninus Pius (138-160) or possibly as late as Marcus Aurelius. 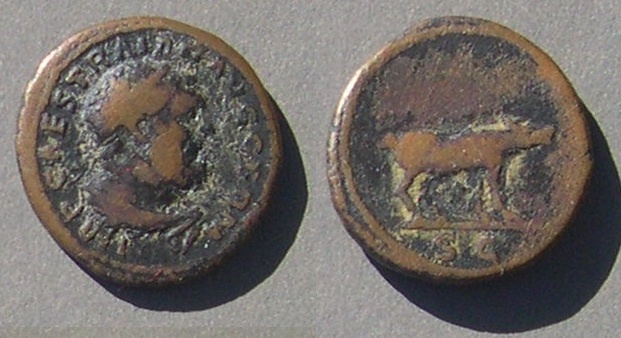 The term quadrans is used for small AE coins much more often than semis. They can be hard to tell apart and if we don't know which it is, we often just call any small coin a quadrans. Criteria for distinguishing the two denomination are discussed later on this page. This particular type is thought by scholars to be a semis, even though it is usually called an "anonymous quadrans." and simultaneously discusses coins of the semis denomination, which are often called quadrantes for convenience because they can be hard to tell apart. καὶ ἐλθοῦσα μία χήρα πτωχὴ ἔβαλεν λεπτὰ δύο, ὅ ἐστιν κοδράντης. "And one poor widow came and threw two leptons, which is a quadrans." ἀμὴν λέγω σοι, οὐ μὴ ἐξέλθῃς ἐκεῖθεν ἕως ἂν ἀποδῷς τὸν ἔσχατον κοδράντην. "Truly I tell you, you will not come out from there until you have paid back the last quadrans." The lessons depend on that fact that the quadrans is the smallest Roman coin denomination. Examples from each category are illustrated next. They are followed by comments on their value, collections, distinguishing the quadrans from the semis, many additional examples, and reference works. 1) Quadrantes attributable to an emperor from Augustus through Domitian. Early imperial quadrantes do not have a portrait of the emperor. Some do not even name the emperor. 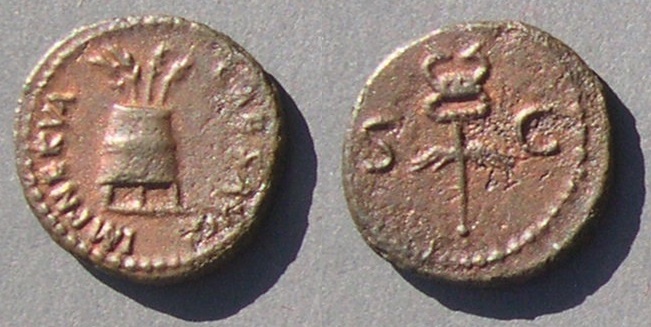 A quadrans struck under Augustus in 9 BC. (Triumvir Auro, Argento, Aere, Flando, Feriundo. "Three men for gold, silver, and bronze, casting and striking"). RIC I 421 page 74. RIC volume 1 is the essential reference for quadrantes of the Julio-Claudian period. After Augustus, early imperial quadrantes name the emperor. 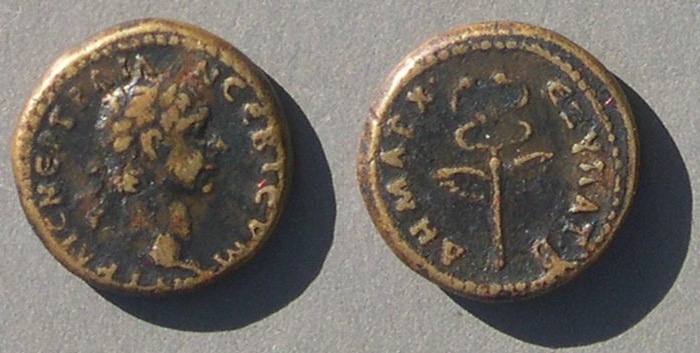 Here is one issued by Claudius (AD 41-54). Claudius is famous from the book and TV series "I, Claudius." Claudius 41-54, struck AD 42. Quadrans. PNR might abbreviate "PONDVS NVMMI RESTITVTVM" (weight of the [gold] coins restored) which refers to restoring the weight of the gold coins to the higher standard used before Caligula reduced it. The rhinoceros was mentioned by Martial in reference to games of Domitian. Normally placid, it could be extremely violent if provoked. For more quadrantes that name a particular emperor see below. There are quadrantes with no indication of who issued them (such as the first coin on this page, and this next one) which are called "anonymous." Attributed to the period from Hadrian to Antonius Pius (117-161). winged caduceus, S C on either side. Nothing on the coin suggests a particular emperor. However, there is, below, a quadrans of Nerva with the same reverse. 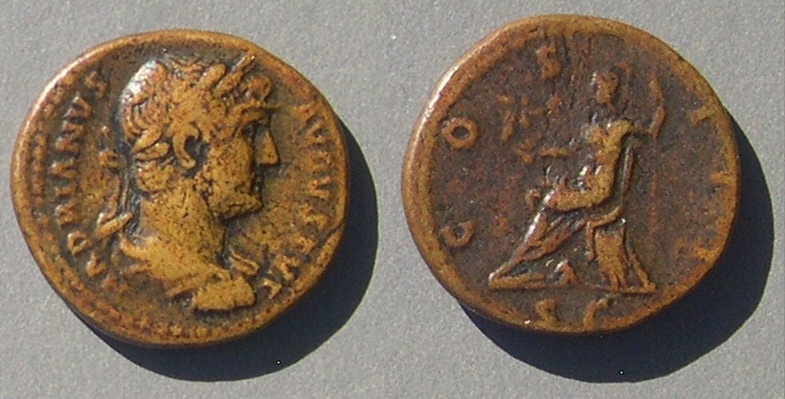 Perhaps that is enough to infer this coin is likely of Nerva (96-98). 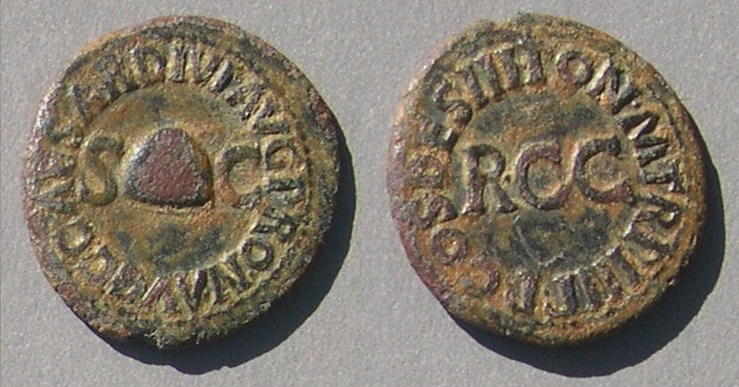 Hoards can be used to put types in relative order when coins are silver or gold (see http://augustuscoins.com/ed/Repub/TimelineTable.html for how Roman Republican coins are dated), but the quadrans denomination was not valuable enough to be hoarded. The few big groups that have been found are from river beds in Italy. Probably they were tossed into the rivers by travelers much like modern tourists toss coins into fountains. The resulting assembledge provides no chronological information. We attribute them by their similarities, if any, to other coins we can date. Although when RIC was published the period of anonymous quadrantes was thought to begin with Domitian, Lamb argues that they are later and the great majority are from Hadrian and Antoninus Pius (AD 117 and later). Some quadrantes from this time period are not anonymous. This one has the name and portrait of the emperor. RIC 691, BMC 1060 "undated"
This one names the emperor without having his portrait. 19 mm. 3.26 grams. Semis. A 19 mm coin looks and feel much larger than a 16 mm quadrans coin, which is reason to call it a semis. Telling them apart is discussed below. For more quadrantes identifiable by emperor, see below. There are rare quandrans-sized coins that name particular mines. Some some name the emperor explicitly, some do not name the emperor but give hints as to who was emperor, and some do not identify the emperor. Sometimes the type names the emperor. Coin of the mines. 18 mm. RIC 703 "R2" "possibly a semis"
Sometimes the type suggests a particular emperor but is not explict. Head right. It closely resembles Antoninus Pius. RIC III, page 313, 1255 "uncertain" [ruler] but "R2" under Marcus Aurelius. The name of the mine suggests Marcus. He could be honoring his adoptive father with the portrait. BMC III --, but BMC IV page 687 has it not in the BM, but cited from a sale. Sometimes the emperor is not identified and the type does the type suggest one. The style suggests it is from the second century, but the type does not suggest a particular emperor. The locations of the named mines are, of course, the subject of scholarly interest. van Heesch ["Small change" p.130] says they were minted in Rome and sent out to the regions of the mines -- the Danube and Balkan regions in central Europe. They have been found in low numbers in Germany and Italy, but much larger numbers in central Europe and the Balkans. Note for collectors: Coins of the mines are all rare and seldom offered, although Lamb says there are many more available than commonly thought (If so, I don't know where they are.) Not a lot is known about them. They are much more expensive than regular quadrans pieces. The quadrans was an "Roman imperial" denomination, as opposed to a "Roman provincial" denomination. 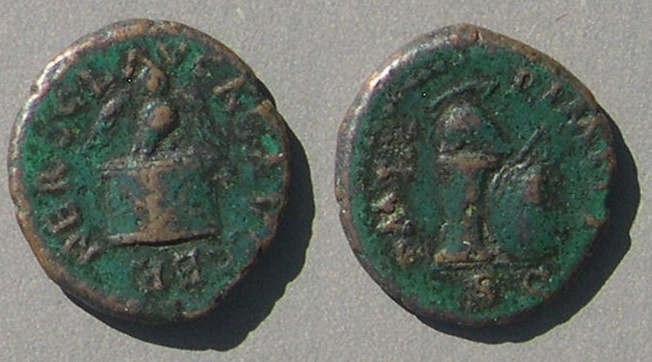 However, some provincial coins have the size of an imperial quadrans. Here is one. Mc Alee 502 "Struck 98-99" "Very rare". RPC III 3657 "Orichalcum struck in Rome for circulation in Syria"
The legend is in Greek (and the coin has a portrait), so it is not an imperial quadrans. Nevertheless, it is somtimes called a quadrans because it probably had that value and we don't know the actual name of the provincial denomination. Value. What could the quadrans buy? Other than the two verses from the New Testament above, few ancient sources mention the quadrans or semis. Horace says the quadrans and the semis were used for admission to the baths. At one site in Pompei, a tavern had a pot which contained 374 asses or dupondii and 1237 quadrantes [van Heesch, "Coin Supply" p. 133], so it served as small change at a tavern. Lamb [p. 52] says "during the years of greatest production under the Julio-Claudian dynasty ... Quadrantes played a significant role in the urban economies of Rome and central Italy," and "The purpose of the Anonymous Quadrantes was to provide the bulk of circulating fractional coinage in Rome and the surrounding area during the reigns of Hadrian, Antoninus, and possibly the early years of Marcus Aurelius." This is spite of the fact that "Roman fractions, even in their most abundant periods and urban settings, are never the commonest finds on archaeological sites. ... Copper asses seem to be found four times more often." Collections. James Lamb, formerly president of Spink's America, wrote an article about quadrantes and his attempt to collect them. I highly recommend it. He found the whole subject more complex than he expected. He notes van Heesch illustrated 591 examples. van Heesch's thesis (in Dutch) is available on-line (see the reference page) and his plates illustrate many types with 3 to 6 examples each, sometimes with different sizes. This web page does not reproduce his work and does not list many of the types. It merely gives an overview. Several sale catalogs have had collections of about 40 pieces (see the reference page). 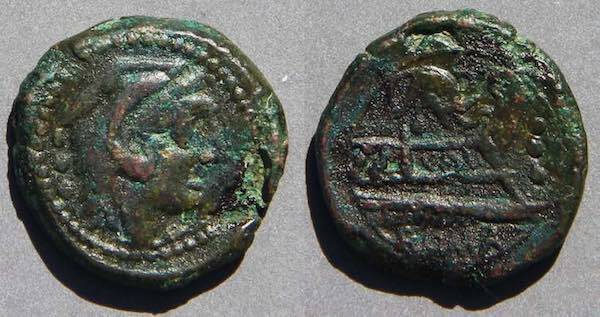 As I write this, vcoins has 255 imperial examples under "quadrans," very few of which are in high grade, among over 200,000 coins offered. As you can imagine, small denomination coins were useful, but their value was low so they were not worth hoarding, so the ones found today circulated a lot and are usually very worn. As I write, a search of vcoins on "mines" found no coins of the mines. Collectors of quadrantes often collect the semis denomination too--both are fractions. Also, only under Nero, who introduced the denomination, do semis coins make up as much as 1/5 the fractional coins--it does not add much to a collection to also include semis pieces. Both denominations are small and they can be hard to distinguish. For example, it would be hard to distinguish the next coin from a quadrans by size alone. (It is only 16 mm and some quadrans pieces are 18 mm.) 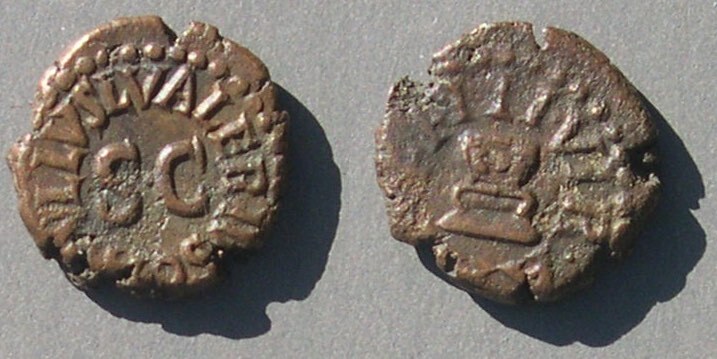 Scholars decided this coin (illustrated to scale) must be a semis because of the small "S" at the top left of the table. 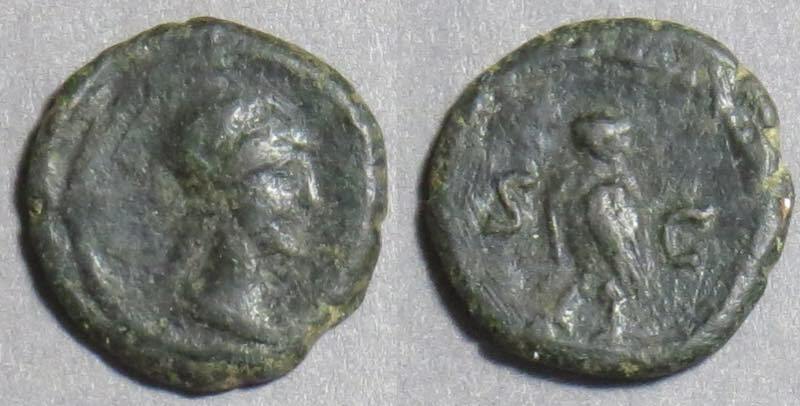 Nero, 54-68. RIC says struck "up to the course of 66." 16 mm and thicker than his quadrantes. 3.57 grams. "After the Greek fashion, a triple entertainment, consisting of music, gymnastics, and equestrianism" Stevenson, DRC. Table, seen from front right, with urn and wreath on top, front panel with two griffins confronted, globe on floor below, and SC in exergue. Also, the portrait suggests it is a semis. 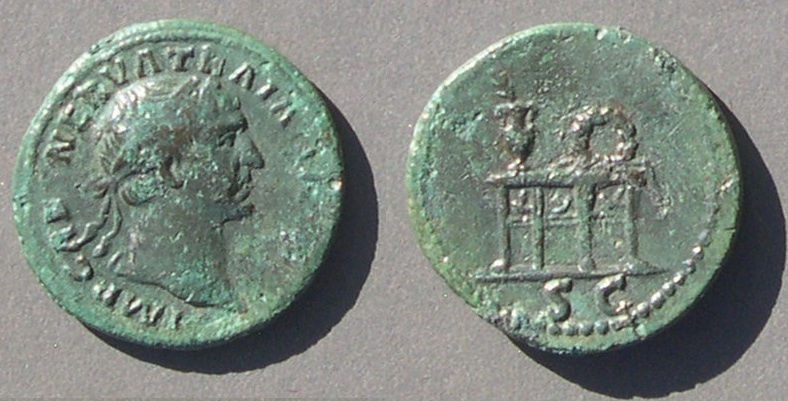 If the current scholarly classification scheme is correct, quadrans coins until Trajan do not have portraits. 1) If it is both small and without an imperial portrait, it is a quadrans. 2) If it is both relatively large and has an imperial portrait, it is a semis. But there are many types that don't fit in either category and are not easy to classify for reasons discussed next. 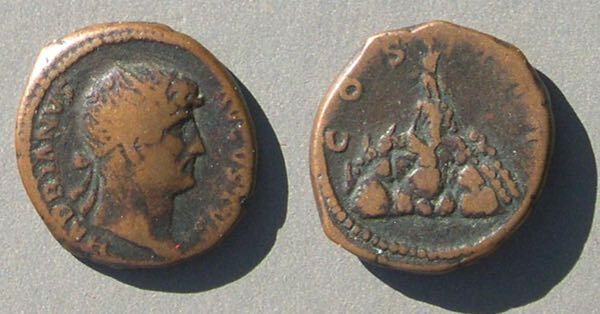 Some small coins are orichalcum (brass, which is yellowish when not patinated) which was more valuable than copper in the ratio of 8 to 5, and some are copper. van Heesch identified both quadrantes and semisses in both metals, so the metal alone does not distinguish the denomination. Also, patina often makes it impossible to tell the metal of an AE coin. Some types, regularly identified as quadrantes, are larger in diameter than others identified as semisses. 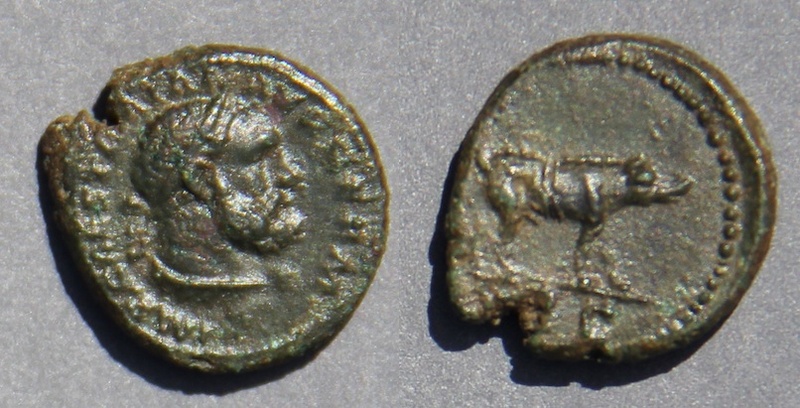 For example, the quadrans of Claudius above is 17 mm and the semis of Nero (just above) is 16 mm. 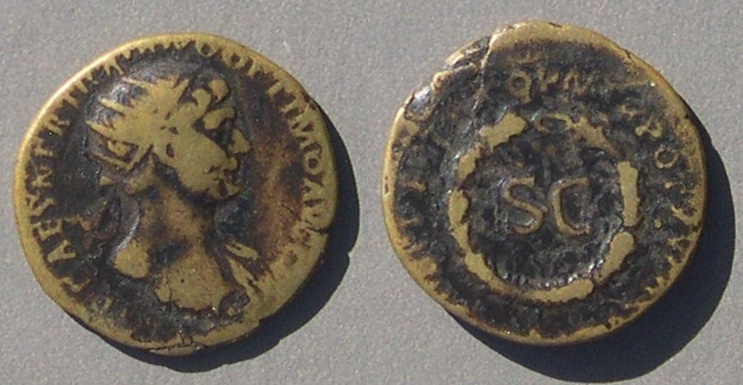 The yellowish color of the Nero coin indicates it is of orichalcum, which makes it intrinsically more valuable than a copper coin of that size would be. However, if it did not have that tiny "S" above the table the argument about its denomination would still be raging. A problem in distinguishing denominations is that the same type may come in various sizes, which suggests the type alone is not enough to tell. For example, the Mars/body armor type at the top which is commonly 18 mm is also found on coins from 14-12 mm. The small ones must be quadrantes and the larger ones semisses. Portrait pieces are almost always semisses. Quadrantes before Trajan do not have a portrait of the emperor. 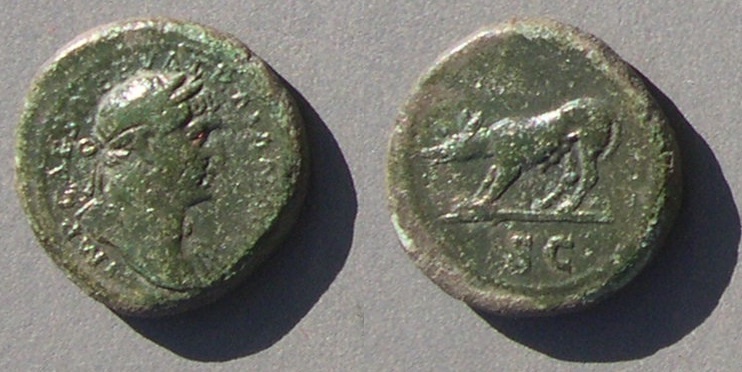 The wolf type of Trajan (above) is almost always called a quadrans but Woytek (in his book on coins of Trajan) calls it a "small semis". If a small AE coin is not a portrait piece, it might be a semis anyway. 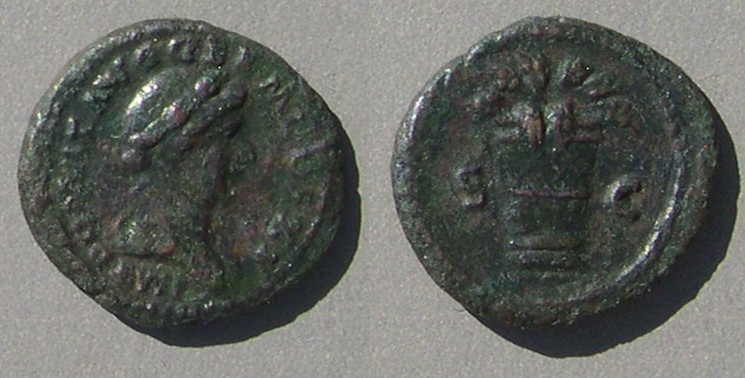 For example, consider the eagle/thunderbolt coin of Hadrian above. 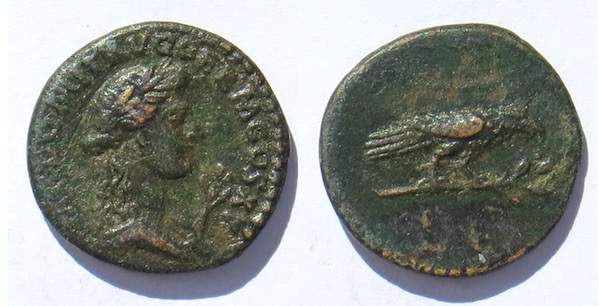 The patina makes it hard to tell the metal, but it is 19 mm (the size of a semis) and yellowish so is probably an orichalcum semis (even lacking a portrait). 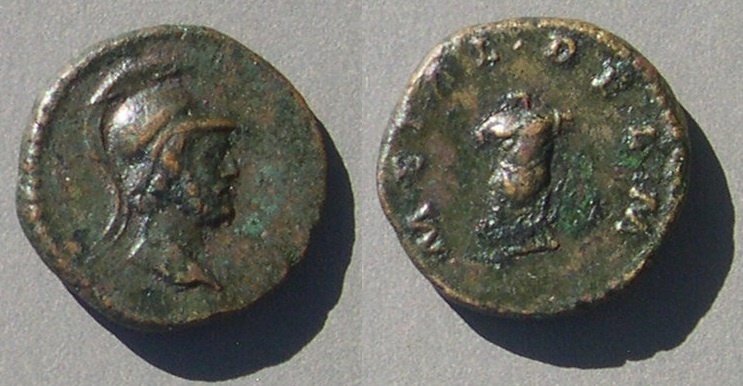 On the other hand, the second next coin (of Claudius) is clearly of copper, not orichalcum, and certainly a quadrans. Scholars have decided that the semis was introduced by Nero, so any earlier small coin is a quadrans. Caligula (37-41) and Claudius (41-54) issued well-known types that can be found in pleasing condition. "Remissa ducentesima", that is "relief from the tax of one part in two hundred"
Claudius, 41 - 54. Quadrans. TI CLAVDIVS CAESAR AVG around hand holding balance, PNR between pans. RIC 85, page 126. Plate 16.85. "25 January 41 - 3 Dec. 41"
Helmet right, on column. Round shield leans on it, spear transverse to right behind. upright olive branch, S C on either side. RIC 255, struck c. 64. Owl, wings spread, on rectangular (circular) altar. RIC 322, struck c. 65. 16 mm and thicker than his quadrantes. 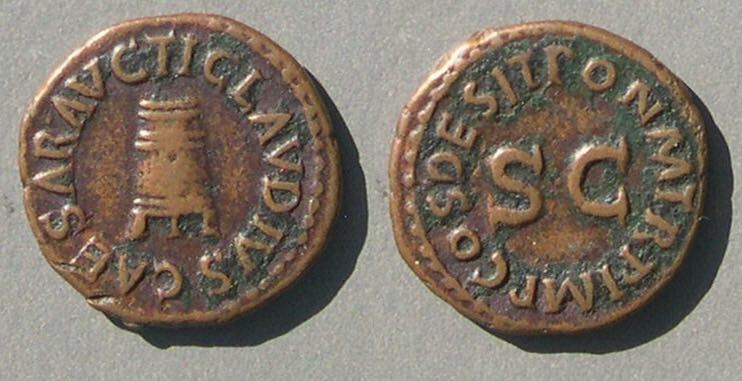 Vespasian and Titus issued only a few quadrans pieces, most with low-quality strikes. Lamb [page 45] says "production seems to be at no more than 10-15% of the volume maintained by the Julio-Claudians." Standard between S and C.
This is a plate coin in Lamb's article, #13, which he remarks is "cold struck." We might hypothesize that inflation made the denomination worth less effort to produce. Nevertheless, Domitian revived it with a range of well-produced types. IVLIA AVGVSTA, Julia (Titi) seated left holding patera and scepter. RIC --, BMC --, Cohen 410, attributed to "Parium(?)". RPC II --. I corresponded with Ted Buttrey and Curtis Clay about it before RIC 2.1 came out. Domitian issued quite a number of quadrans types with his name, but not his portrait. He greatly increased the supply of small change by minting and sending to the legions in the north much more small change than previous emperors [van Heesch, p.130]. These are undated, but the title "GERM" puts them at or after the resumption of AE coinage in AD 84. RIC puts most in AD 85. Helmeted head of Minerva right. Olive branch between S C in lower field. RIC 428, page 207, plate 140 "AD 85". RIC II.I 235, page 282, plate 140 "84-85"
RIC II.I 315, page 286, plate 143, struck "85". 18 mm. 3.03 grams. Semis. RIC II.I 710, page 316, plate 155 [The RIC plates coin gives Ceres features like Domitian] Struck "90-91". 20-19 mm. 2.87 grams. Semis. RIC II.1 311, Struck "85"
Sear --, would follow 2821. 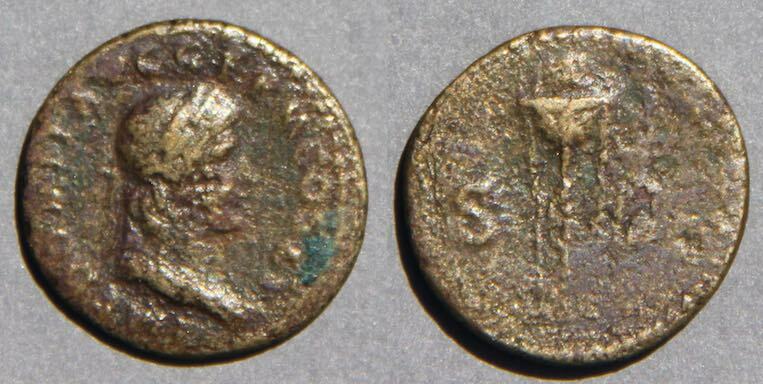 RIC II.I 250, struck "84-85"
RIC II Nerva 113 "undated"
The reverse resembles the reverse on the unattributed "anonymous" coin above, which suggests that coin might also be of Nerva. 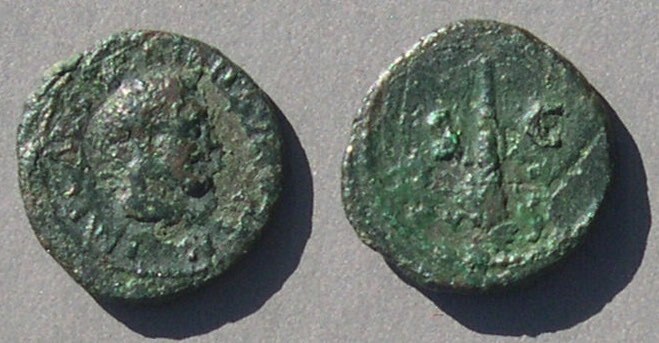 Trajan issued quadrantes with and without his portrait. There are several varieties with a wolf on the reverse with no legend other than SC. BMC 1061, page 226 "undated"
RIC II 702, page 294. Illustration of 691, but described there as a wolf. It can be hard to tell if a wolf or a boar was intended. RIC II 702, page 294. Illustation of 691, but described there as a wolf. Fortunately the obverse legend names Trajan. RIC II 699, page 293, plate XII, 212. 19 mm. 3.31 grams. Semis. Hill 232 "issue 10, donative, AD 105"
Under earlier emperors quadrantes did not have portraits. Under Trajan they sometimes do. However, the larger size of this one allows us to decide it is a semis. 19 mm. 2.93 grams. Orichalcum semis. Antioch mint. Metcalf ANSMN 22 (1977) plate 8.1. Both the yellow color of orichalcum and the radiate crown indicate this is a semis. 19 mm. Quadrans? It has the diameter, but not the portrait, of the next coin. RIC 685, page 428. "AD 125-128". BMC 1356, page 441, plate 83.7. Sear II 3700, page 170. 21-20 mm. Semis. 3.87 grams. This coin, at 21-20 mm, is larger than a quadrans. 18-16 mm. Semis. 2.54 grams. Sear II --. van Heesch 188-190 (pdf page 294). 19 mm. Semis. 4.99 grams. The reverse has COS III and Mt. Argaeus, a design issued at Caesarea in Cappadocia. BMC [p. 441 n] "the little pieces with COS III, Mount Argaeus, are certainly Eastern and therefore omitted here" (cf. 1356-7, plate 83.7, page 441). 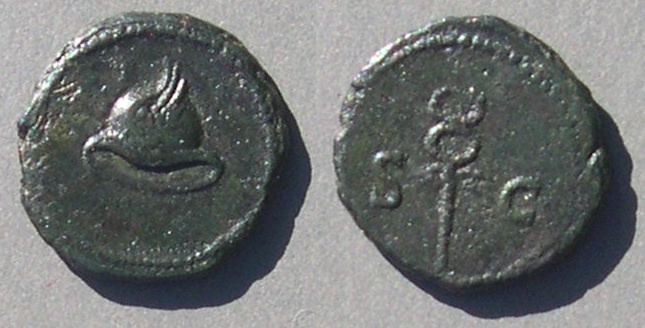 These are Eastern, but of Roman style (possibly actually minted in Rome?) and surely of Roman denomination. 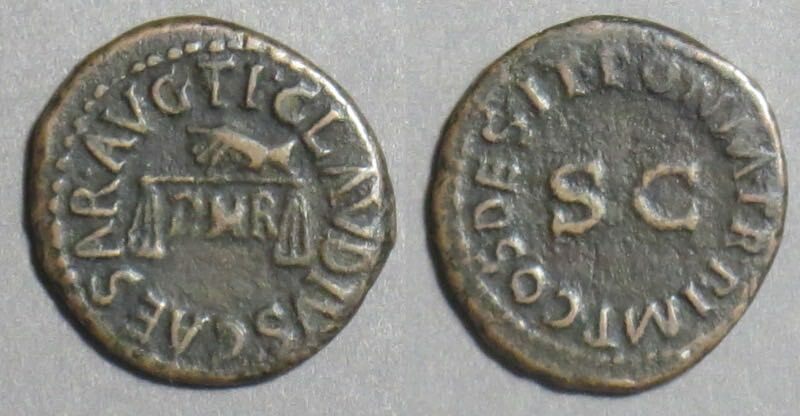 Roman Provincial Coins III 3159. 18-16 mm. Quadrans or semis. 2.55 grams. for the Capitoline triad of Minerva, Jupiter, and Hera. RIC III A.P. 709a, struck "140-144"
There are quadrantes attributed to Antoninus Pius that do not have his name on them. 19 mm. 2.36 grams. This is large enough in diameter to be a semis. Look at the bust. Does it remind you of any emperor? Lamb suggests it was struck by Antoninus Pius. Eagle standing right on thunderbolt, head left, S C either side. The obverse description is the same as the previous coin, but the bust is much different and the coin is smaller. This one has the chin line of Marcus Aurelius, not Antoninus Pius. A cataloger might describe the two with the same words, but a collector would be justified in considering them different types. How can this coin with the same type as the previous coin be so much smaller? I don't know. Maybe the previous coin is really a semis and this is its half. Maybe enough time has elapsed between them such that, with inflation, the denomination became smaller. Maybe the metal of this one is orichalcum (it appears to be), worth more by weight, so the coins could be smaller and worth the same if the larger one is copper. We know that there are no quadrantes or other small imperial coins like this after Marcus. Maybe this was one of the last and so small and of such low value that the denomination was discontinued. The next coin is relevant. Owl half-right, facing, S C either side. This coin is even smaller than the previous one. If the quadrans is the smallest denomination, this must be a quadrans. Maybe it is unusually small, but if not, then the two larger coins above are hard to explain, given the semis usually has a portrait of the emperor. RIC II 24, page 218. Nothing on this coin suggests any particular emperor. Minerva bust right, helmeted and draped. Owl standing left, head facing. RIC II 8, page 216. RIC II page 218, 19. The first Roman coins were very large base-metal cast pieces issued in the early third century BC. The Roman as was originally a whopping coin weighing a Roman pound of twelve ounces and the quadrans weighed one quarter of that--three ounces. 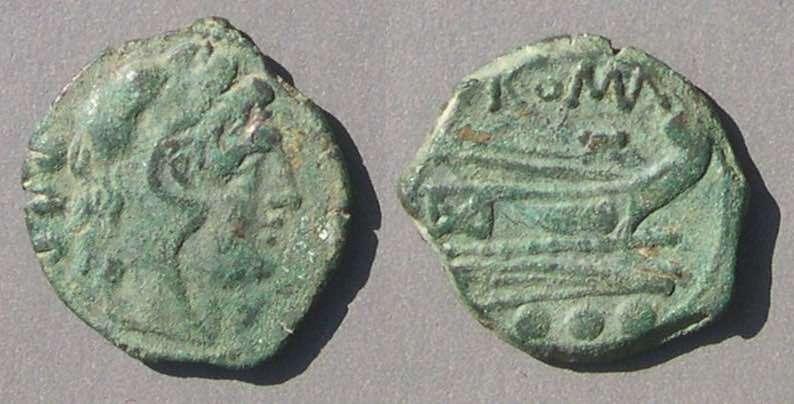 Under the financial strains of third-century wars their sizes decreased dramatically and by the middle of the second century BC the as and quadrans had become much smaller and seldom issued. The silver denarius dominated the official currency, almost to the exclusion of other denominations. The Roman state issued very little new small change, so the old copper coins served to fill the need and remained in circulation and became very worn. Also, small coppers were both imported from elsewhere and produced unofficially. The Republican quadrans denomination was distinguished by three dots. The three dots on each side refer to 3 ounces among 12 in an as, making four of these to an as. The next two are quadrantes. Anonymous, 128 BC, but likely to have been issued by a Caecilius Metellus (because of the elephant's head which that family used). Head of Hercules right in lion-skin headdress, three dots vertically behind. Prow right, elephant's head above, ROMA below, three dots vertically to the right. The quadrans of 128 BC is still much larger and heavier than it will eventually become. Prow right, ROMA above, three dots below. Republican quadrantes continue the Hercules/prow type. After c. 86 BC the denomination was discontinued and not revived until Augustus. Here is a second example of the revived denomination (the first was near the top). 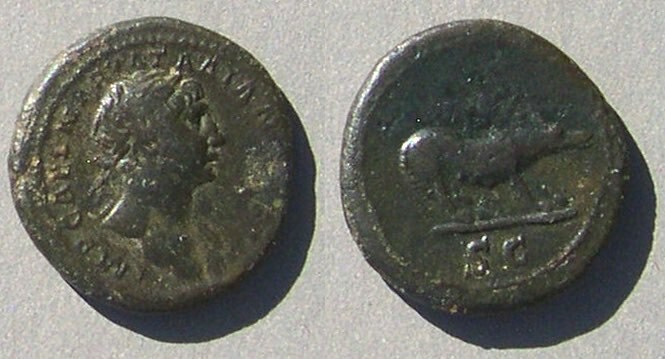 A quadrans struck under Augustus in 4 BC. 16 mm and quite thick. 3.66 grams. 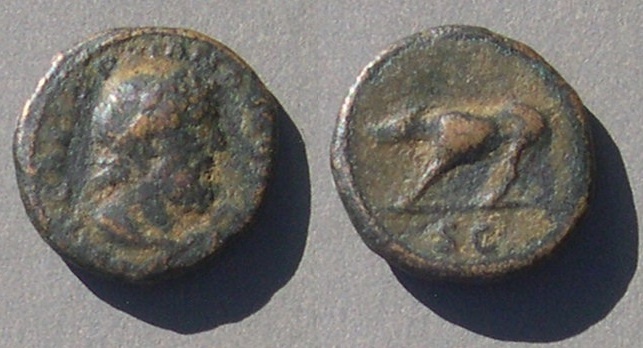 RIC Augustus 468, 4 BC, page 78, mint of Rome. Here is a page of reference works about the quadrans denomination. This is the end of the survey of the quadrans denomination. Go to the main Table of Contents page for this whole educational site.